Heat grill. In small saucepan, combine preserves, mustard, soy sauce and marjoram; mix well. Cook over low heat until preserves are melted, stirring frequently. When ready to grill, sprinkle both sides of pork chops with salt and pepper. Place chops on gas grill over medium heat or on charcoal grill 4 to 6 inches from medium coals. Cook 12 to 15 minutes or until pork is no longer pink in center, turning once and brushing with preserves mixture during last 2 minutes of cooking time. To serve, bring any remaining preserves mixture to a boil. Serve with pork chops. 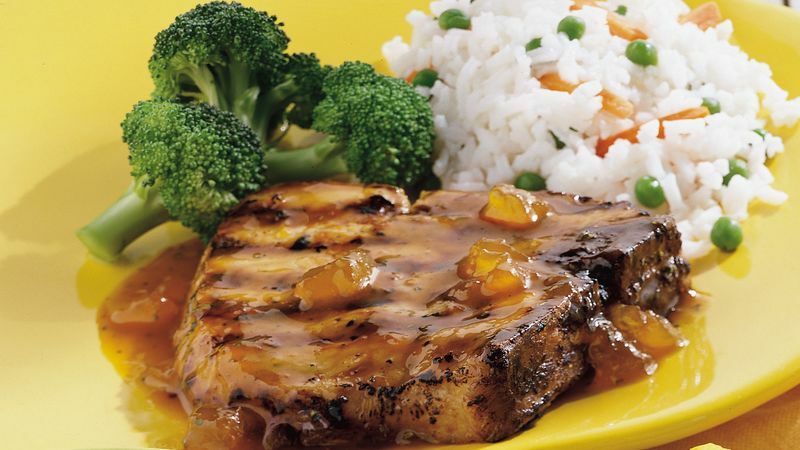 To broil pork chops, place on broiler pan; broil 4 to 6 inches from heat using times above as a guide, turning once and brushing occasionally with preserves mixture.